Perseverance, hope, strength, and provision are the words continually on our minds during the 100 days we were honored to spend with Levi last year. Levi was born on January 31st 2012 and left this world to go hang with Jesus on May 11th 2012. It’s crazy to think its been a year and a half since we lost him. We wouldn’t be here if it weren’t for those four words rooted deeply in the love and grace of Jesus Christ. Recently I was approached by a friend and sister in Christ to start sharing our story with others. God’s timing is always perfect because I have been feeling a nudge from Him lately to start putting my thoughts down on paper. This is why I will begin blogging about Levi’s story, my life, and what God is teaching me. Please extend me grace as you read these posts. I am working through the lie that I am not good enough to be sharing, teaching, or leading others when it comes to the things of faith. I am not the best writer, speaker or presenter and hope you will bear with me as I begin this new chapter of my life. So here it goes……what I believe God said to me this morning. Disclaimer…..pastors and friends who are much smarter than me, I will try my best with the history and theology. The knowledge about God and the bible that I have may be limited, so please respond to this post if you see anything in my statements that may be off. I was reading in the book of Job, which I don’t want to go there today, and the book of Matthew. Starting in chapter 1 of Matthew we see the genealogy of Jesus. Pretty simple; just a list of names from Abraham to Jesus, all the generations. Forty-two generations total. That’s a lot of history. We see beginning in v. 18 the story of the conception and birth of Jesus. Now Joseph was engaged to Mary and has not had any relations with her yet. She comes to Joseph and tells him that she is pregnant. Let’s stop there. I don’t know about you but if Dana came to me back in our college days when we were first dating and told me she was pregnant by the Holy Spirit I would have sent her away just as Joseph had planned to do with Mary (v.19). The original Greek word for “send” here is also the same word for divorce. However that’s not what stuck out to me this morning, what did was in v. 20 where we see the angel speak to Joseph in a dream concerning Mary. He starts by saying: “Joseph, Son of David…..” Now lets back up to v.16, Joseph is not the direct son of David, he is the direct son of Jacob. Why say son of David and not the son of Jacob? I believe it’s to remind Joseph where he came from. He is a descendant of the God of Abraham, Isaac, and Jacob; a descendant of the God of David. I believe God needs to remind Joseph where he came from, that he is still a part of the family; a part of His story. This truth gives Joseph the hope, strength and perseverance to continue by Mary’s side. Knowing it would mean being ridiculed, scorned, and cast out of the community they were a part of. If my history serves me right, being an adulterous woman would mean being stoned to death. I’m sure people didn’t look to kindly on Mary and Joseph during this trying time. If I heard from God that I was His child, in His family, and in His story, it would have been exactly what I would have needed to hear so I wouldn’t send Dana away either. This is exactly what Joseph needed to hear in order to stay with Mary. Mary needed Joseph to take care of her. Just like Dana needed me to take care of her and vice-versa. We need one another to persevere through the difficult transitions of life. At church on Sunday the pastor taught on perseverance. He went as far to describe that there are two different types of perseverance. One that is a prideful perseverance and the other a humble perseverance. He went on to describe how Peter was doing all these great things for Jesus but when it came time to watch and pray with Him in the garden, Peter couldn’t even last one hour. His point was that we can persevere on our own ability and still do good things but is that what Jesus really wants of us? He wants us to persevere through His strength and His provision. He wants us come to Him first , in prayer and petition and receive the strength that only He can give. This is the meaning of true perseverance. 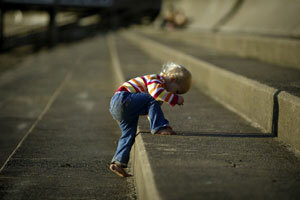 Are you persevering on your own ability or through the grace of Jesus Christ? One verse that got me through the difficult time of our son Levi’s hospitalization was Jeremiah 29:11 “For I know the plans that I have for you,’ declares the Lord, ‘plans for welfare and not for calamity to give you a future and a hope.” (NASB) Put your trust and hope in these words and you will be able to persevere through any trial that will come your way. Blessings to you.